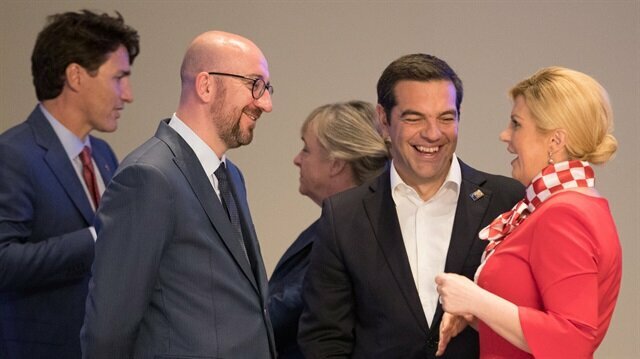 Prime Minister of Canada Justin Trudeau, Belgian Prime Minister Charles Michel, Prime Minister of Greece Alexis Tsipras and Croatia President Kolinda Grabar-Kitarovic are seen prior a working dinner at the Parc du Cinquantenaire during the NATO Summit in Brussels, Belgium. Greece said on Thursday it still seeks good relations with Moscow, a day after it expelled two Russian diplomats for trying to bribe officials and foment demonstrations to thwart a deal to allow Macedonia to join NATO. Greece reached an accord last month with its tiny northern neighbour to resolve a dispute over the former Yugoslav republic's name, which had prevented Macedonia from joining NATO and the European Union for decades. Greece has a province called Macedonia, and argued that the former Yugoslav state's name implied territorial ambitions against Greece. Under the deal, Macedonia will become North Macedonia and Greece will lift its veto of its neighbour joining the EU and NATO. The June 17 accord still must be approved by a referendum in Macedonia and a vote in the Greek parliament. It is opposed by nationalists in both countries, some of whom have held demonstrations. On Wednesday, Greece expelled two Russian diplomats and barred two other people from entering the country, accusing them of having meddled by encouraging demonstrations and bribing unidentified officials to thwart the Macedonia agreement. The foreign ministry in Moscow said on Wednesday it would respond in kind to Greece's expulsion of two Russian diplomats, Interfax news agency reported.Greece will expel two Russian diplomats and ban entry to another two for activities inconsistent with their status, Greek newspaper Kathimerini reported on Wednesday.There was no immediate comment on the report from Greek authorities.The newspaper said the move followed perceived attempts by the diplomats to undermine a name-change agreement Greece brokered with the former Yugoslav republic of Macedonia last month, ending a decades-old diplomatic standoff. The incident was a rare hiccup in traditionally close relations between the two countries which, despite Greece's longstanding membership in NATO, have religious and cultural links spanning centuries. "Russia is a friendly country with whom we have very good historical relations, but Greece considers international law as the foundation of all bilateral and multilateral relations, so in defending our sovereignty," George Katrougalos, the deputy to Greece's foreign minister, told Reuters. "We had to react to what we considered to be a breach of the obligations under international law of the diplomatic activities in our country," he said. "Still, we believe that this is going to be an isolated incident exactly because it is in our intention to safeguard the very good Greek-Russian relations." French President Emmanuel Macron on Thursday denied the U.S. president Donald Trump’s claim that NATO powers agreed to increase defense spending beyond previous targets. "There is a communique that was published yesterday. It's very detailed," Macron told a press conference in Brussels. He added the communique "confirms the goal of 2 percent by 2024. That's all. "US's Pompeo urges allies to cut off funding to IranThe summit statement affirmed a commitment made in 2014 after Russia annexed Crimea that NATO allies would halt defence spending cuts and start spending more as their economies grow, with the aim of moving toward 2 percent of GDP within a decade.On Wednesday, day one of the meeting, Trump took aim at NATO members’ defense spending, calling on allies to not only meet the minimum goal of spending 2 percent of GDP on defense, but also urged them to double that to a total of 4 percent.Voting begins to elect Turkish parliament’s new speakerOnly five NATO members have met the 2 percent benchmark to date, including the U.S. NATO expects the number of countries that are meeting the guideline to rise to eight this year, and expects the number to rise to 15 by 2024.Trump, however, sent a tweet from the summit insisting members "must" meet the goal, set in 2014, "IMMEDIATELY. "Macron said he did not believe it was necessarily a good idea to raise the target for NATO members’ defense spending to 4 percent of GDP from 2 percent, as Trump has suggested.The French president also denied reports that Trump threatened to withdraw his country from the NATO military alliance in a dispute over funding. "President Trump never at any moment, either in public or in private, threatened to withdraw from NATO," Macron told reporters.He said the leaders of the alliance’s 29 members met in an extraordinary session on Thursday morning at the request of NATO Secretary-General Jens Stoltenberg. NATO leaders agreed on Wednesday to invite Macedonia to begin accession talks to join the western alliance, extending its reach in the Balkans in defiance of Russia.